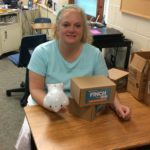 One of the 2018-2019 grant recipients; Christine Schullo, a math and computer science teacher at Evansville High School, will be able to expand the applications of programming within her classes with the new addition of Finch Robots. The idea for applying for the grant came from only having enough robots for people to work in groups of 2 or 3, causing some students to get distracted. With the addition of more robots, there has been a rise in engagement, focus, and exploration within the class. Although an entry-level robot, the Finch is equipped with light, temperature, and obstacle sensors, accelerometers, an RGB LED, motors, and a sound buzzer, allowing the students to have an even more creative and interactive learning experience. Some applications of these features include programming the robot to solve a maze, using the keyboard of a computer as a piano, and remotely controlling the robot. So far the students have showed a heavy interest in the newly introduced robots, exploring the possibilities for programs and creating their own games that can be controlled with the Finch. The use of these robots may also be useful to the students who plan to take the AP Computer Science test, furthering their knowledge of various programming languages and the process of objective based programming. Going forward, Mrs. Schullo plans to incorporate other programming languages into the robotics curriculum, such as Python, and Snap!, alongside the already included C++, Java, and Scratch, as well as possibly expand into more advanced robotics.